Build and rebuild THE LEGO® MOVIE 2™ character Queen Watevra Wa’Nabi in 15 different forms with 70825 Queen Watevra’s Build Whatever Box! This creative builder set has instructions to build each version of the shape-shifting queen, from a grumpy volcano to a happy butterfly or colourful rocket. This versatile building toy also comes with inspirational ideas for young master builders to create their own shapes. 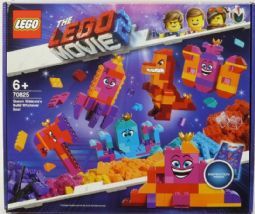 • This THE LEGO® MOVIE 2™ set includes instructions to build each model, plus inspirational ideas to build the queen into even more shapes. • Queen Watevra Wa’Nabi in pile-of-bricks form measures over 4” (11cm) high, 2” (7cm) wide and under 1” (1cm) deep.